Camera metering systems will usually provide a "technically correct" exposure. Unfortunately, the camera can't anticipate what you CREATIVELY want to achieve! Do you want a photo where the background is blurred, or in focus? Do you want to convey a sense of motion, or freeze it? 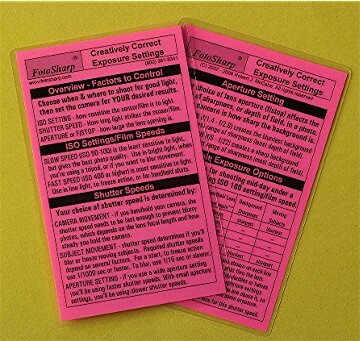 This 3.5" x 5.5" laminated cheat sheet reviews the camera settings for proper exposure, how they interrelate, and helps you choose camera settings for the "creatively correct" exposure that matches your vision.